Information on facelifts, rhinoplasty ( nose surgery ), eyelid surgery and other facial cosmetic surgery procedures including facial surgery before and after photos, local facial plastic surgeons, videos and more. Learn about the benefits and risks involved with these facial plastic surgery procedures, find the facial plastic surgeon or facial cosmetic surgeon that’s right for you, obtain patient financing and make an informed decision. 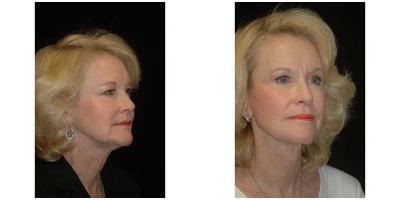 Facelift surgery is designed to increase the youthful appearance of the face. Although it cannot stop the aging process, it is an effective step in maintaining younger beauty. 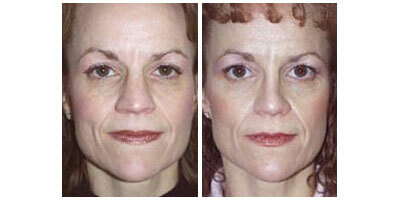 A facelift is also known as a rhytidectomy. 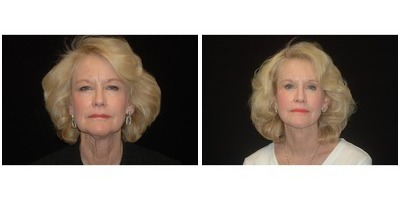 This procedure is the tightening of skin muscles within and around the face. When this is done, wrinkles are removed and your skin appears to be smooth again. Over time, as the period between surgeries lengthens, the skin will loosen again, and oftentimes patients come back for another facelift. 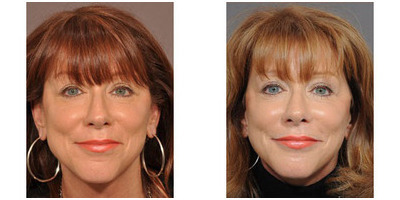 Men or women whose skin has begun to sag around the mouth, chin and neck are all viable candidates for this procedure. It can increase your self-confidence. The most common age of patients having this surgery is those in their forties to sixties. 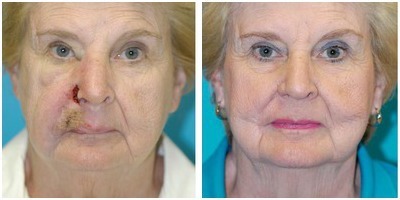 Over a period of time, gravity will make wrinkles appear on the face. Significant weight changes particularly weight loss can have a large impact on your facial appearance. Your skin may be lax and prone to wrinkles merely from hours of sun exposure. Tightening or lifting the muscles around the neck and face literally pull the wrinkles away. When operating, surgeons make incisions along the top of the scalp, following the natural hairline all the way down to the ear. The fat is then trimmed or suctioned out, separated from the muscle and the skin is pulled taut, removing wrinkles. The underlying membrane and muscles are pulled tight as well. Once tightened, the fat is removed and the scalp stitched back together. The healing process is short. The results can last for a decade or longer. It depends on the amount of sun exposure you have, how fast you age, the quality of your skin, your skin tone, your age, and even whether or not you smoke. Smoking can induce wrinkles around the mouth, chin and upper lip. It may cause you to return for a facelift sooner than expected. 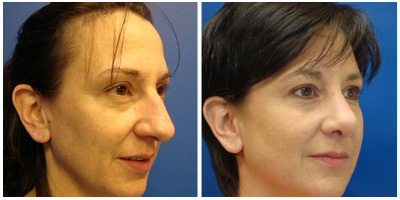 Rhinoplasty, also known as Nose Surgery, is the general reshaping of the structure and shape of the nose. Some people are not happy with their noses, due to the fact that they present breathing difficulties, are too large or too small. In this instance, it doesn’t take much to correct it. 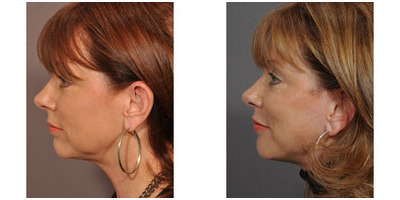 Nose Surgery should only be performed on those whose facial structure has been established. In other words, they are finished growing. In women, this age is about 16, and in men, around 17 years old. The procedure itself can take several hours, or a single hour, depending on what’s being done, and how much work is required to achieve the desired goal. There are many plastic surgeons that perform the surgery from inside the nose, making their incisions within the nostrils instead of visa versa. Conversely, more complicated procedures may require the use of “open” surgeries. When this is done, a small incision is made across the single vertical piece of tissue that separates one nasal passage from the other, also known as the colmnella. After this specific procedure is completed, a small splint – much like you would wear on an arm or wrist after spraining it – will be applied to the outside of the nose to help it retain its new shape. There are also softer strips and splints that can be placed within the nose in order to support the septum without injuring it. You can talk to your doctor and decide if you would rather use general or local anesthesia. If your nose is weak in any one area, a piece of bone or cartilage from another area may be inserted to provide stronger support. 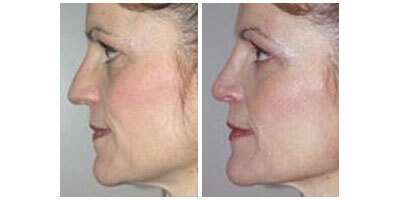 This procedure reshapes the bone, skin and cartilage of the nose. You may also find that it helps relieve breathing issues. Sometimes a deviated septum can make breathing difficult. In this case, surgery can help to separate the nasal passages through which breathing is done. 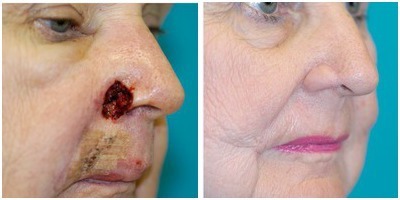 This is also known as a septoplasty, and is often performed with a rhinoplasty or as a procedure by itself. Cartilage may also be grafted from inside the nose to help achieve a desired shape. You may also reduce or increase size, angle, narrow the bridge of the nose, change the width and so on. The skin is separated from the nose during the operation and the nose is then sculpted into the shape you want. After, the skin is replaced and you’re left with a reshaped nose. 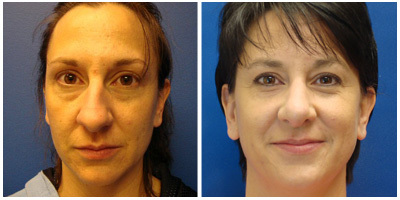 View nose surgery before and and after photos.